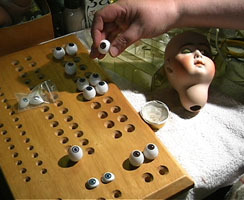 We see the different parts of the body at this doll museum. Can you describe this monster in German? In this section pupils learn the German words for the parts of the body, and some descriptive adjectives. 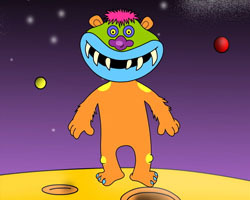 Pupils are enabled to give simple descriptions of their appearance, and use colour adjectives to describe monsters. We also learn to sing 'Heads, shoulders, knees and toes' in German. Der Struwwelpeter (1845) is a popular German children's book by Heinrich Hoffmann. He wrote and illustrated it initially for his own son as a Christmas present, because he didn't like the other children's books then available. It has ten illustrated rhyming stories. Each has a clear moral that demonstrates the disastrous consequences of misbehavior in an exaggerated way. The title story, "Struwwelpeter" (Shock-headed Peter), describes a boy who does not groom himself properly and is consequently unpopular. 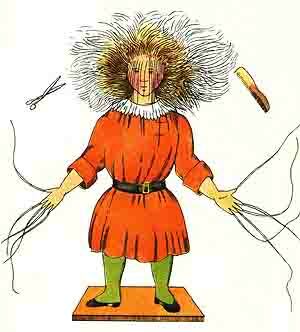 What do children think of Struwwelpeter? Read Professor Ellen Handler Spitz's recent article on why Der Struwwelpeter is often misinterpreted as an authoritarian book,. She says children DON'T see the stories as grown-ups trying to frighten them into mindlessly obeying rules. Write your own Struwwelpeter story? Chapter 2.15 challenges children to write and illustrate their own story in the style of Struwwelpeter. You could write a story like the tale of Pauline, one of the other nine in Hoffmann's book. Pauline is warned not to play with matches, but she can't resist the temptation. Her fate? She burns to death - pretty grim, but maybe children see it as a necessary warning, with humour in the exaggeration. Pauline's kittens observing the scene in Hoffmann's own illustration (see right) add a touch of fantasy to remind children that this warning of real-life dangers has more than a touch of black humour - which helps make it memorable. 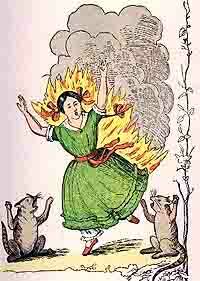 Disobedient Pauline played with matches; her kittens watch in horror as she burns to a cinder in front of them. Is it funny? Does this whimsical exaggeration appeal to children?